- What was your viewpoint regarding firearms, their uses and misuses, and legislation coming in to the project? At the beginning of the project I had no understanding of why anyone would need or want to own a gun, besides hunting. I thought that the whole gun debate was about just having the right to own a gun, and that people didn't care much about actually using a gun. - In what ways was that viewpoint challenged by our class conversations, your research, and the exhibition? I reached an understanding about why people fight for gun rights. For some its a hobby and for some its a lifestyle, but the fight is not just about legislation, it's about ownership. After learning about current gun laws I also realized how many rights we already have. Unlike many other countries there is no gun that you can not legally own. Sure there are licenses to own those weapons, but you CAN own them and that is crazy. - What adversity did you face during this project and how did you overcome it/make your way through it? For a large part of the project many of the courtroom rooms group members were unmotivated and would not work independently. The plan was to have half of the people work on one side of the room and half work on the other but I ended up having to create the whole NOW part of the room by myself which was hard. - In what ways did you contribute to your group and the class as a whole? I tried to be think of questions that would really make people think about their Ideas of gun legislation. These hard questions really drove conversations to a higher level and helped others question what they believe. ​The giant poster in the courtroom room (depicted above) is mine. I did the research, designed, wrote and printed the poster. 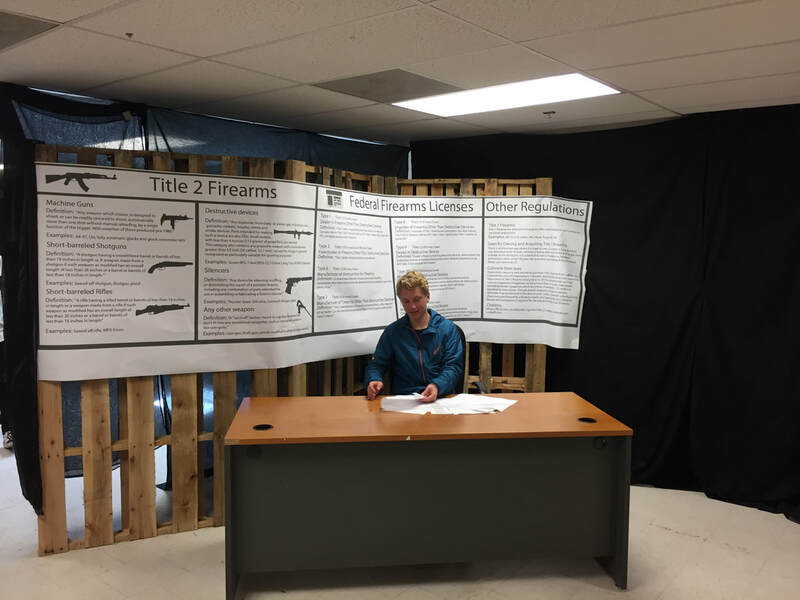 I'm pretty proud of my work, I worked hard on creating a tool to inform people about gun laws in the us. We started by studying Dr. King’s ideas of Civil Disobedience and his definitions of what makes a just vs unjust law. We then studied various moral and political philosophies of justice that have influenced our legal systems including Deontology, Utilitarianism, John Rawls’ and Libertarianism. To start the bulk of the project we researched various issues of injustice in Durango, and heard from community organizations about the issues they are working on from homelessness to immigration to environmental issues. We researched these issues and then voted on one to tacke that was Homelessness. We researched homelessness, hearing from various community organizations who already work on this issue (Axis, Ed Aber, Food Not Bombs, Veteran Homestead Project). On of these discussions with an organization ended in a field trip to the Test Tracks camp. After all of the research we voted and defined the problem and goal of our event. Lastly we Planned the event and created projects to achieve our goal, and did! The goal of our event was to raise awareness and compassion for people experiencing homelessness. During start of the even t we had two keynote speakers. After the speakers people had time to walk around a check out peoples projects. Finally at the and they opened up the kitchen and started the meal during which Harley made his speech. The event was great It did exactly what we wanted it to do. Many of the people at the event wanted to help with the issue but just didn't know how, and we educated them on how. Some people at the event had misconceptions about the homeless, and we educated them. But, most importantly we brought this important debate to light. I learned a lot about the people in our community the night of the exhibition. The most memorable experience was when one of the people experiencing homelessness came to look at out test. When that happened every time a homeless looking person came up he stopped and said thats me. I Learned how lowly people can see themselves. It seemed like he was just seeing the difference between what he was and what he wanted to be.